Mr. Frank’s research utilizes state-of-the-art computer simulation programs to visualize and communicate the unique performance characteristics of historical structures and their connection to the immediate environment. The emergence of state-of-the-art tools provides an unprecedented opportunity to visualize how building boundaries shape fluid dynamics, bridging the gap between the configuration of building enclosure systems and naturally replenishable renewable energy sources. Furthermore, knowledge of these strategies becomes crucial as his work seeks to communicate the performance-oriented nuances of building culture, as an alternative yet equally valuable set of criteria used to highlight the significance of high-performing historical structures for their continued preservation. Through extensive periods of development, early populations advanced their specific knowledge base about the most effective use of construction resources in providing improved levels of comfort within the built environment. These structures were based on a fundamental zero-energy response to dynamic climatic conditions, using construction strategies such as orientation, degree of enclosure, and material systems to intensively shape adequate thermal zones for human inhabitation. Much work in this area has been contributed by James Marston Fitch who articulated how distinct architectural attributes related specifically to their natural environment, countering current building trends which utilize hermetically sealed building envelopes and steady-state interior environments which struggle to make such a direct connection. To better understand the passive climatization potential of historical structures relative to variable inputs including prevailing wind and solar path, this study explores a series of chronologically and geographically distinct housing typologies which demonstrate a progression of knowledge about the most effective use of construction strategies in providing improved levels of comfort within the built environment from classical European to pre-industrial American cultures. Classical European housing typologies investigated include the Insula Row House, the Peristyle House, and Terraced Slope House. Pre-Industrial American vernacular typologies investigated include the Shotgun House, the Dogtrot House, the Bungalow House, and the Antebellum Mansion. These typologies are modeled and analyzed with assistance from Megan McDonough and Natasha Sanjaya, Graduate Students of Architecture at Yale University and the University of Pennsylvania respectively. While both ancient and vernacular case studies discussed above supply ample evidence of the thermal zoning strategies employed by populations from antiquity to the 19th century, they also provide the opportunity to compare patterns of thermal zoning between classical European and vernacular American traditions, highlighting shared influences and progressive developments between the two traditions in spatial organization within hot temperate climates. 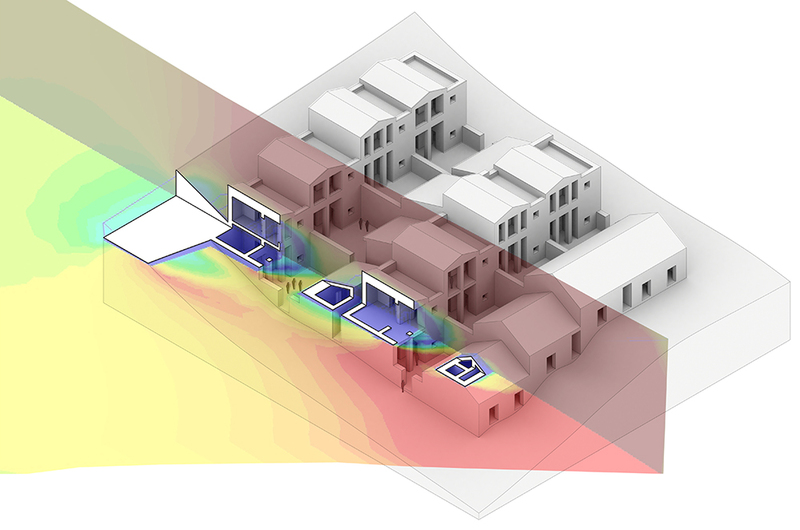 This comparative survey discloses distinctions in thermal zoning strategies, underscoring our appreciation of the unique construction and material characteristics provided by each culture. Finally, the full extent of passive climatization strategies identified by these case studies also have clear and recognizable significance in contemporary culture and extend the survival of these traditions by highlighting their relevance in contemporary time. Funding for Mr Frank’s research is made possible through the generous support of the Samuel H. Kress Foundation.